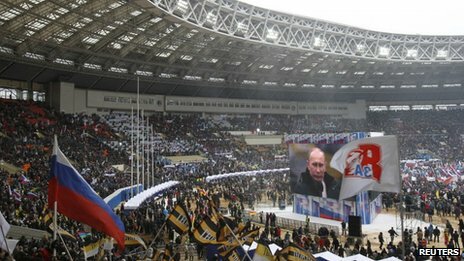 The BBC's Daniel Sandford in Moscow: "However unfair the election will be he certainly will command the greatest vote... even if it was completely fair"
A crowd of thousands has heard Vladimir Putin deliver a strongly patriotic speech at a Moscow stadium as he bids for re-election as president of Russia. Pledging to win "the battle for Russia", he said he would not allow interference in the country's affairs. The 78,360-seater Luzhniki stadium off the city centre is a sea of banners from the ruling United Russia party. Alleged massive ballot-rigging accompanied the general election held in December. Since that vote in December, a protest movement has gathered momentum, staging the biggest opposition rallies in decades in the Russian capital. Mr Putin is widely expected to win the presidential race and denies that fraud in December was widespread. Moscow police say at least 130,000 people were at Thursday's rally. It was being held under the slogan "Defend the country" and falls on Russia's annual Day of the Defenders of the Fatherland. This is the biggest rally in support of Mr Putin's re-election so far, the BBC's Steve Rosenberg reports from the stadium. It is a colourful event designed to re-establish Mr Putin's image as national leader but not everyone taking part is a Putin supporter, he adds. Two railway workers told our correspondent their managers had made them take part while a group of university students said they had been paid to come, and had been told they were being bussed not to a political rally, but to a folk festival. Mr Putin, the current prime minister, began Thursday by laying a wreath at the Tomb of the Unknown Soldier outside the Kremlin. At the stadium, his voice strained by emotion at times, he told the crowd that Russia was under threat from "interference". "We will not allow anyone to interfere in our affairs, to force their will on us," he said. "Because we have our own will. We are a victor nation. It's in our genes." Without naming any opposition politicians, Mr Putin urged Russians "not to look abroad, to scuttle to the side, and not betray their motherland." He quoted 19th-Century Russian poet Mikhail Lermontov's patriotic poem Borodino about "dying outside Moscow" and prevailing in battle. "The battle for Russia goes on!" he said. "We will win!" 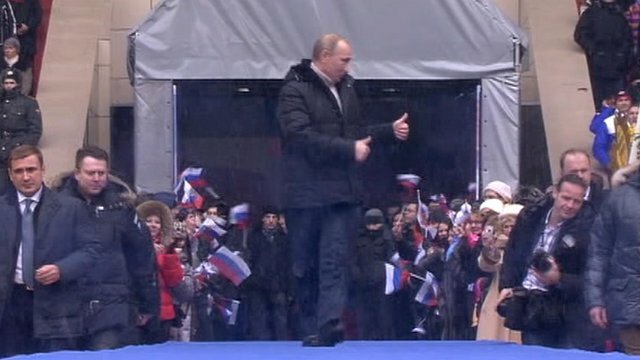 He urged the crowd to "say that we love Russia". "I want to ask you - and I want you to give me an unambiguous response, please answer with a simple short word - yes - do we love Russia?" "Yes," the crowd shouted back. Following the speech, popular Russian folk rock band Lubeh, whose leader Nikolai Rastorguyev is a close Putin ally, took the stage for a concert. Russian opposition bloggers reacted with disdain to Mr Putin's attempt to identify his re-election campaign with a patriotic holiday. Pavel Senko (@senko) tweeted: "Did our grandfathers beat the Nazis in '45? So vote for Putin! Disgusting." The US imposes sanctions on seven Russian people and 17 firms linked to President Putin's "inner circle" over their role in the Ukraine crisis. Could new net neutrality rules fuel internet piracy?